Glass is in, or bubble tops made a comeback. 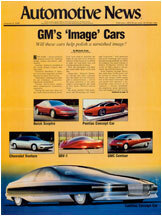 According to Automotive News, January 4, 1988, GM’s ‘Image’ Cars (Buick Sceptre/Lucerne, Pontiac Banshee, Chevrolet Venture, SRV-1, GMC Centaur, and Cadillac Voyage) were to be featured at New York’s Waldorf-Astoria Hotel (like the Motoramas of old) in a show entitled, “GM Teamwork and Technology for Today and Tomorrow.” In the Automotive News article (you can download the entire article in PDF format here or at the bottom of this post), this show was intended to polish a badly tarnished image and silence criticism of the corporation. 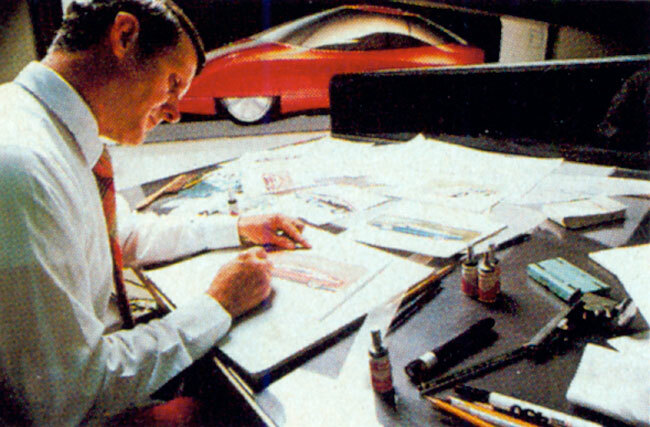 These image cars became Chuck Jordan’s number one priority when he became Vice-president on October 1, 1986. 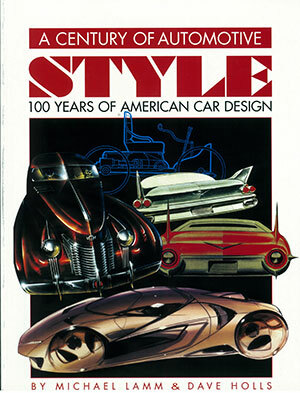 The article is an interesting read with quotes from Chuck Jordan, Design Staff VP; Lloyd Reuss, executive VP of North American car operations; Phil Garcia, chief designer of Advanced Studio 1 (Buick Lucerne); Allen Young, chief designer of Advanced Studio 4 (Cadillac Voyage); Don Lasky, chief designer of Chevy 1 studio and designer Bob Munson (Chevrolet Venture); Dave North, chief designer of Olds 2 studio (Olds Aerotech); Jim Brinkerhoff, interior designer of the Centuar; and Clark Lincoln, chief designer of Advanced 2 Studio (SRV-1). The automotive industry is in a mess right now for a variety of reasons, not the least of which is decades of government intervention. But corporate thinking was also often part of the reason why things are like they are now. 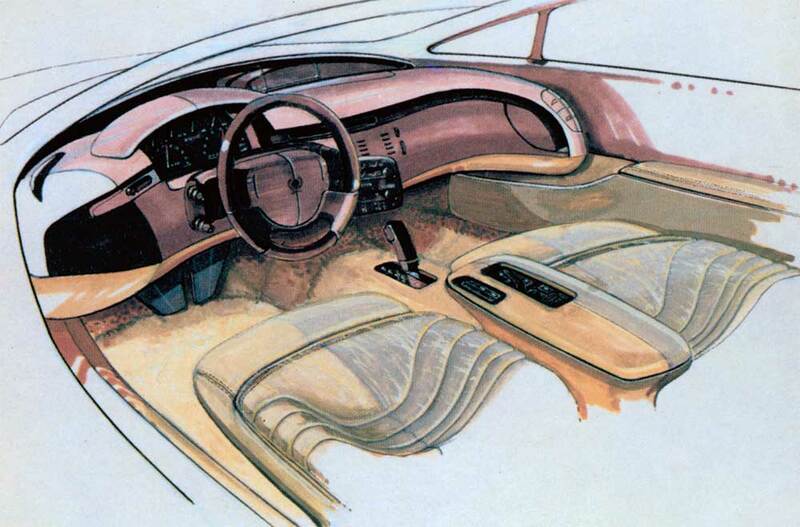 This article in Automotive News sheds some light on what the thinking was like in the ’80s. Sometimes you have to break some rules to come up with something new. But sometimes something even newer can emerge from staying within the rules and solving old problems in more creative ways. That’s tougher, though. The Banshee is a futuristic Trans Am. “The Trans Am is the personification of what a Pontiac is. 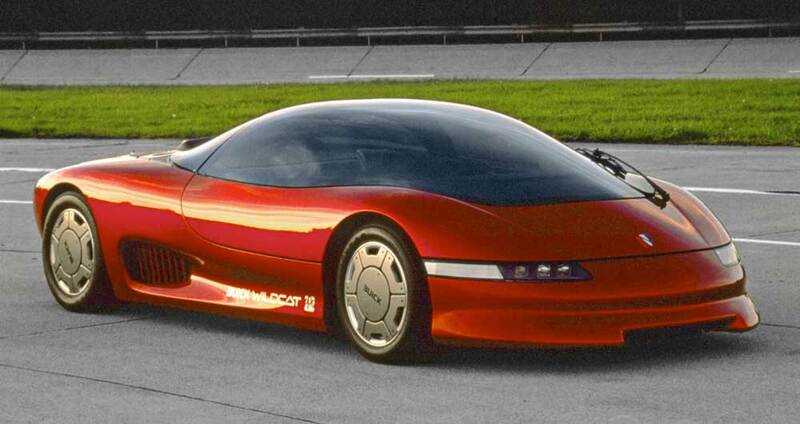 The car exhibits Pontiac’s requirements of being exciting and performance-oriented through aggressive use of materials and shapes,” stated Chuck Jordan. Again glass is used as sheet metal. Tom Peters designed the Banshee. I’m probably going to get into trouble here. The Banshee and SRV1 influenced the ’92 Camaro/Firebird designs. That helps explain why the production cars looked the way they did and why perhaps they weren’t as successful in the marketplace as they could have been. 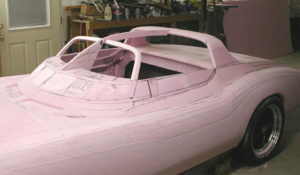 The SRV1 was essentially a mid-engine design, and the Banshee was a three-dimensional sketch with no visual clues as to where the engine might be. 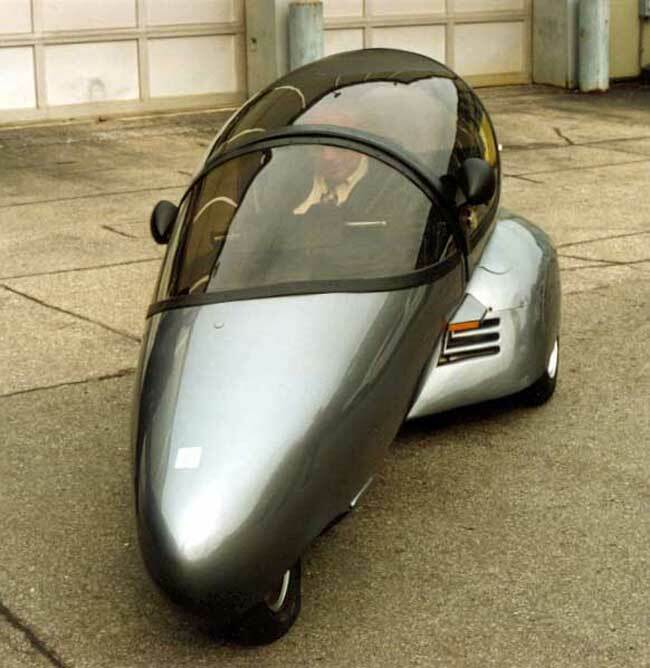 With the base of the windshield so far forward, it also looked like a mid-engine car. 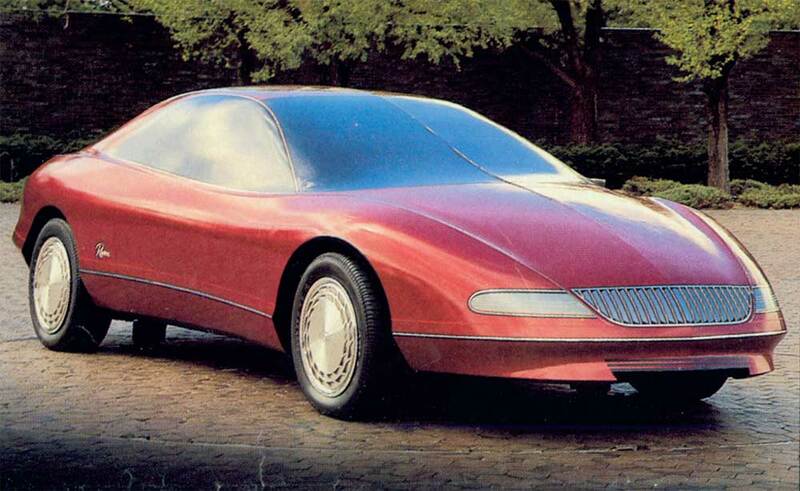 The ’92 F-cars had a similar “cab-forward,” mid-engine look about them. I have no issue with mid-engine designs. But the familiar and popular F-car package consists of a front engined, rear wheel drive package with a long dash to axle, long hood, short deck, and 2+2 seating. They are wheel oriented cars with great stance. In the ’60s they developed a racing heritage in SCCA’s Trans Am series. That’s the car. Always has been. 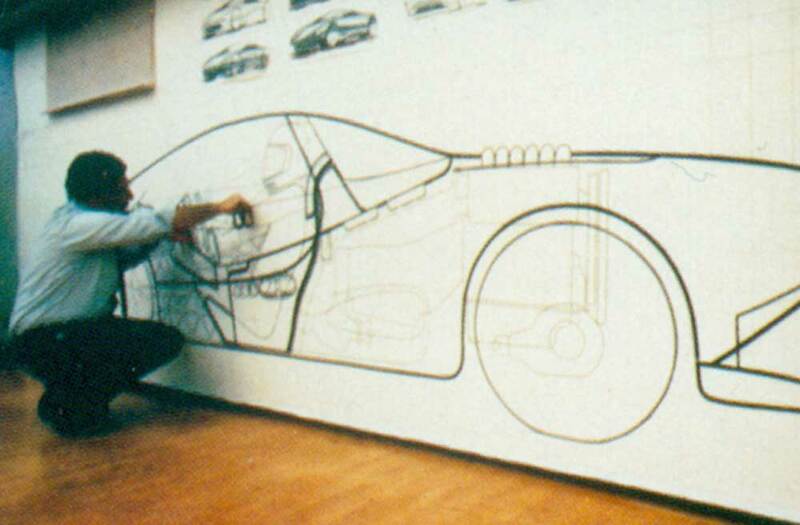 An appropriate design for an F-car will reinforce the architecture for all it’s worth. But the ’92 F-cars had the center of the windshield over the center of the engine! Why force a mid-engine design to work on a front engine car? Don’t get me wrong. A 4th generation Camaro SS will still turn my head, but there is something fundamentally dishonest about the design. And they are a pain to work on with the back half of the motor under the windshield structure. In contrast, Mustangs in those years still looked like Pony cars. 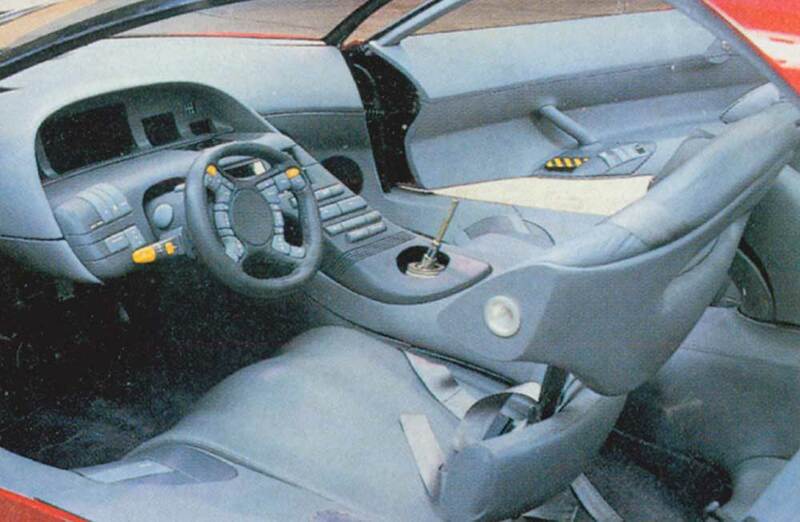 According to Automotive News, the SRV-1 loosely represented Group Lotus. 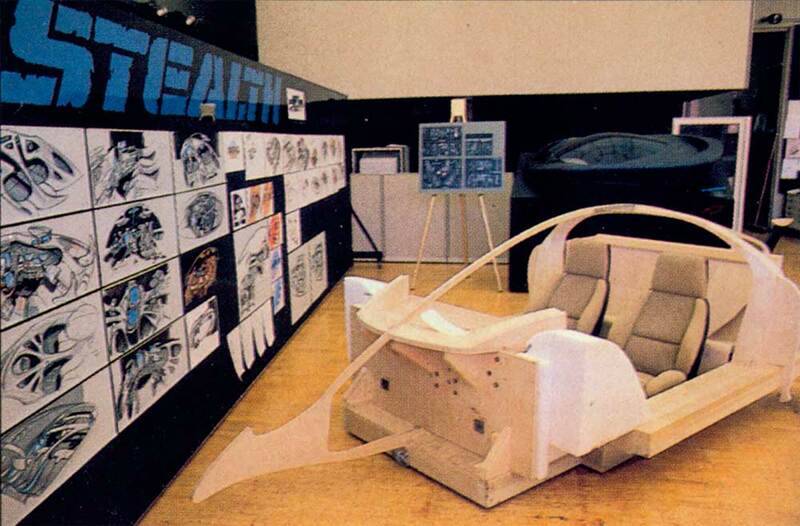 Clark Lincoln, chief designer of Advanced Studio 2, said that it was known internally as the Stealth and designed to be the ultimate advanced two-seater sports vehicle. The car was proposed to have all sorts of electronic gadgetry, including sticks to steer the car, doubling as a shifters (somehow). Communications systems, voice-activated controls, heads-up display, and night vision. Whew. I’m missing the last page of the article so there might be more, I don’t know. 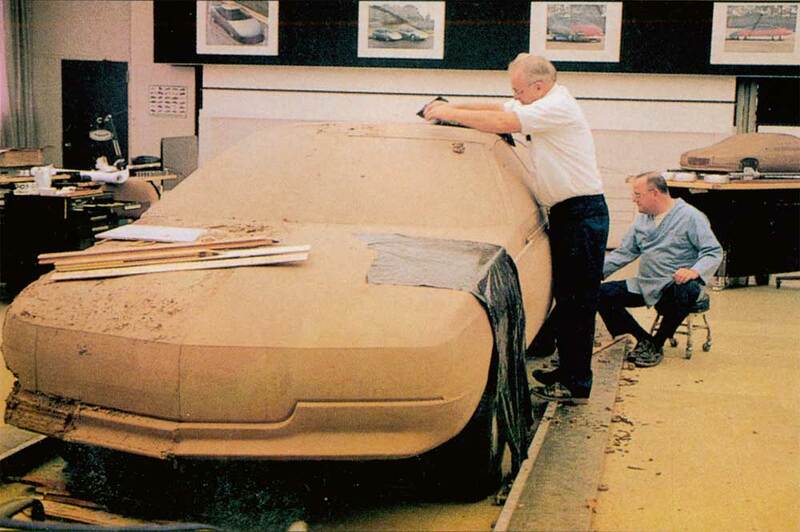 The car is a really beautifully executed styling exercise, and influenced the design of the ’92 Camaro. Let’s just let it go at that. 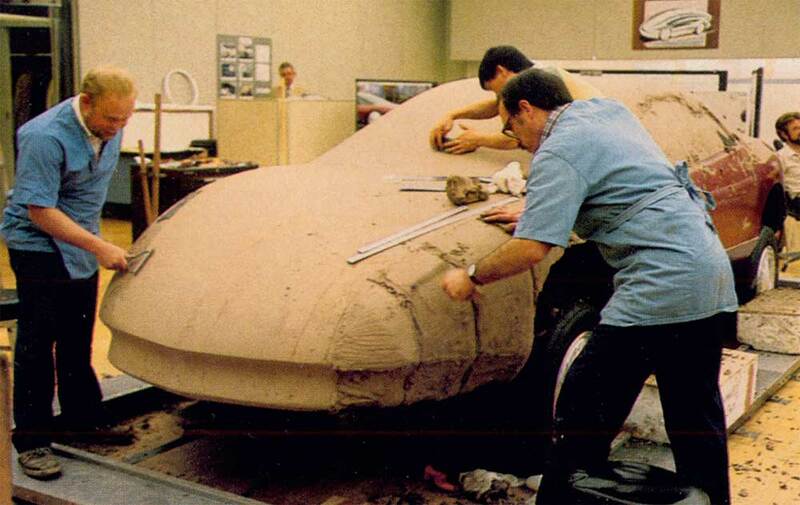 I do remember a fiberglass scale model of the car on display in the production studio hallway for quite a while. 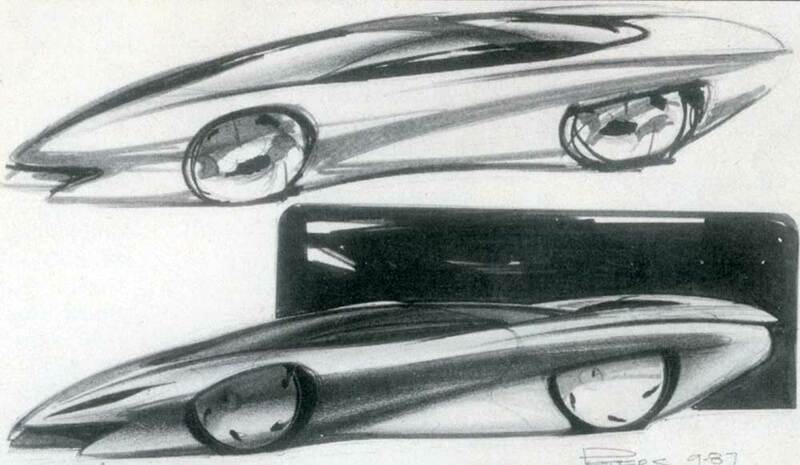 Like somehow it was supposed to inspire new frontiers in taillight bezel design. Nonetheless it was a gorgeous sculpture. 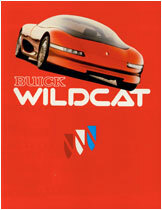 The Wildcat brochure (you can download the PDF here or at the bottom of the post) explains the features of this running car. It is interesting that even with all of the valve train and fuel delivery sophistication, the DOHC 3.8 litre V-6 developed a modest 230 horsepower and 245 lbs. ft. of torque at 4,000 RPM. 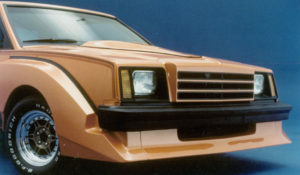 Just a few years later the pushrod Buick Turbo V-6 installed in the Grand Nationals and 1989 Pontiac Turbo Trans Am would put out closer to 300 horsepower and 340 lbs. ft. of torque at a stump pulling 2800 RPM. The drive train of the Wildcat was interesting. All wheel drive with the transmission in front of the engine. I don’t remember ever seeing the car at GM or anywhere else. 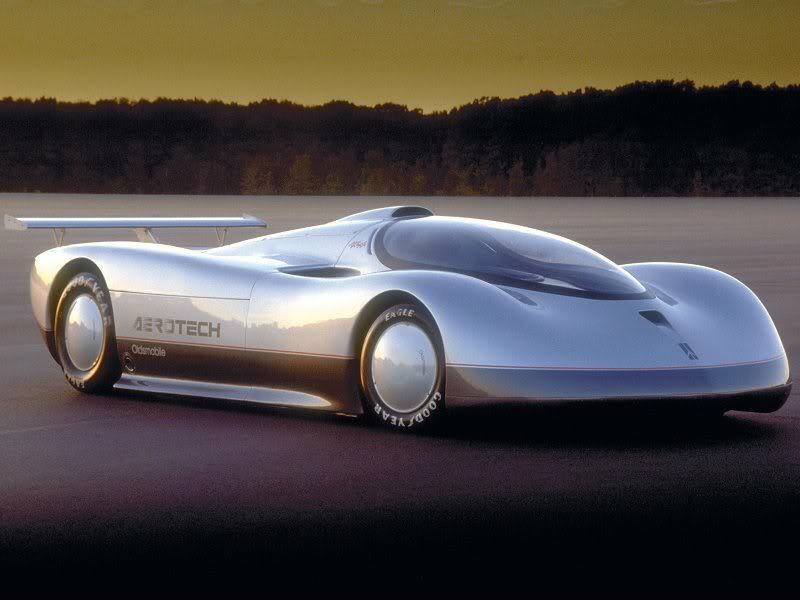 The Oldsmobile Aerotechs were a series of experimental high-speed vehicles created between 1987 and 1992 incorporating the latest in performance technology with the intention of breaking multiple automobile speed records. The first such car was driven by four-time Indy 500 winner A.J. Foyt to a world closed-course speed record of 257.123 mph (413.788 km/h) on 27 August 1987 at the 7.712-mile (12.411 km) test track near Fort Stockton Texas. 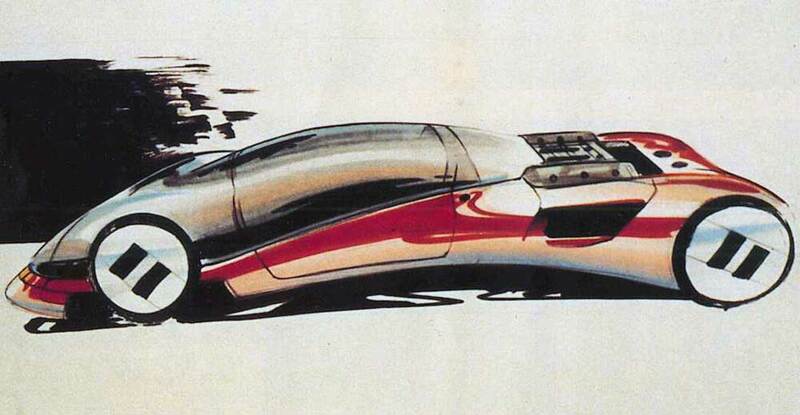 Prior to this, on 26 August 1987, the car had posted a top speed over a mile of 267.88 mph (431.10 km/h). The car consisted of a March Indycar single seat chassis enclosed in an extremely efficient aerodynamic body shell. 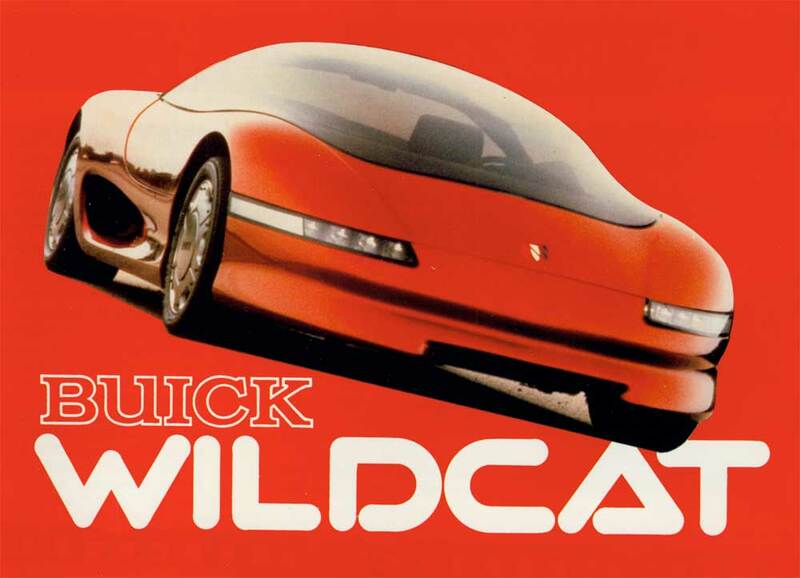 It was powered by a highly turbo-charged version of the 2-litre Oldsmobile Quad 4 engine. 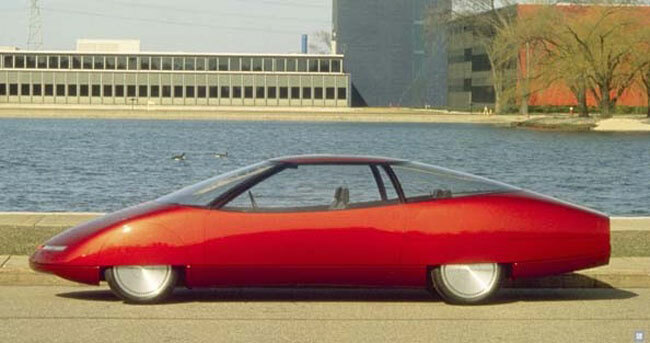 The Aerotech body was designed by GM Design staff and was one of the sleekest vehicles ever developed for use on a high speed track. The design of the Aerotech included the capability of adjusting underbody sections to control the distribution of downforce, front to rear. Oldsmobile produced three versions of the original Aerotech to prove the capabilities of the company’s Quad4 engine. Two were short-tailed (ST) versions and one was long-tailed (LT). 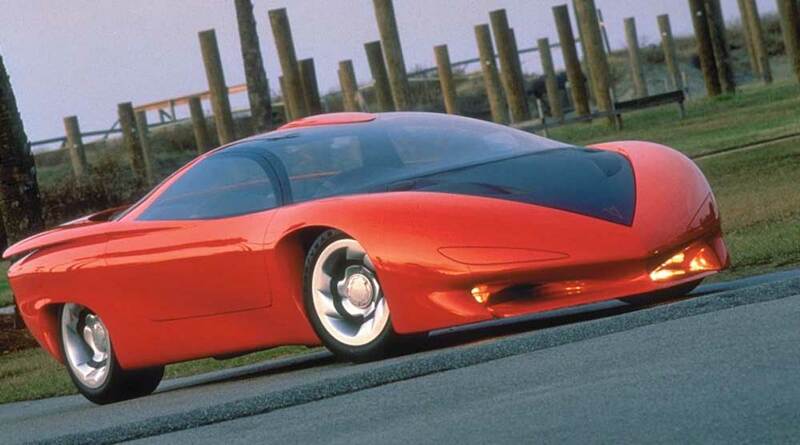 Subsequently, between December 6–14, 1992, another version of the Aerotech, this time powered by a 4.0 litre Oldsmobile Aurora V8 engine and fitted with lights, broke 47 speed endurance records including the 10,000 and 25,000 kilometre world speed records. Other national and international speed records ranging from 10 kilometres to 24 hours were accomplished by a team of drivers working 24 hours a day for 8 days. 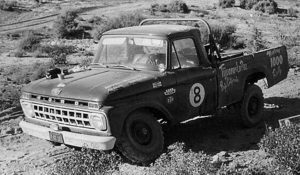 These records were also set at the Fort Stockton test track. I was in Olds 2 Studio when the project was started, and saw it being tested at the wind tunnel. 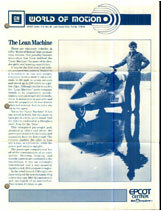 According to Dave North, “The premise of the Aerotech was an engineering project more than a design exercise. 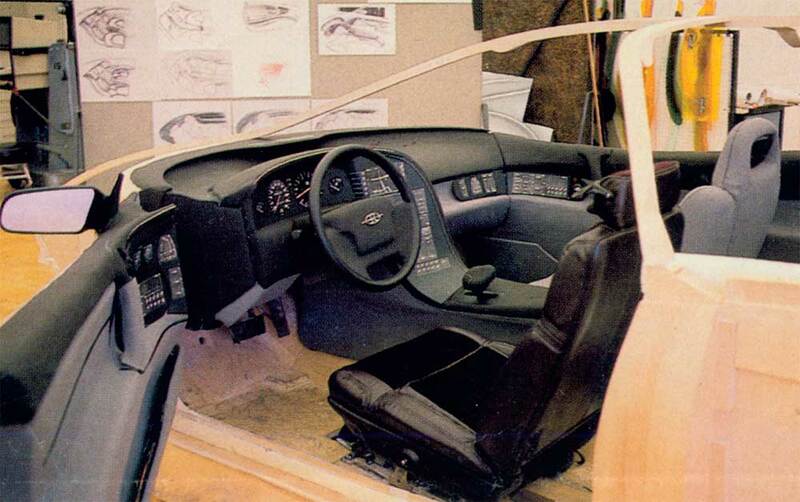 Form followed function more than usual because the car had an assignment…to run as fast as we could.” Dave continued, “We have a car in the studio now…it is a replacement for a production car for the 1990s. 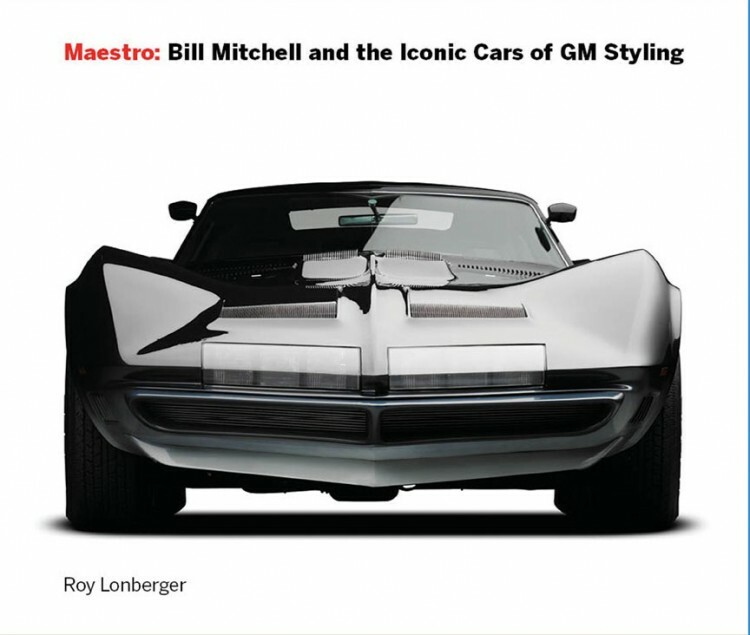 You can see some of the Aerotech in it…the areo influence and the smooth, integrated shape—one shape being the whole design of the car, not with pieces tacked on.” I was in the studio at the time, or had just been transferred to Cadillac. The only car I think of that fits his description is the 1992 Olds Achieva SCX Coupe. 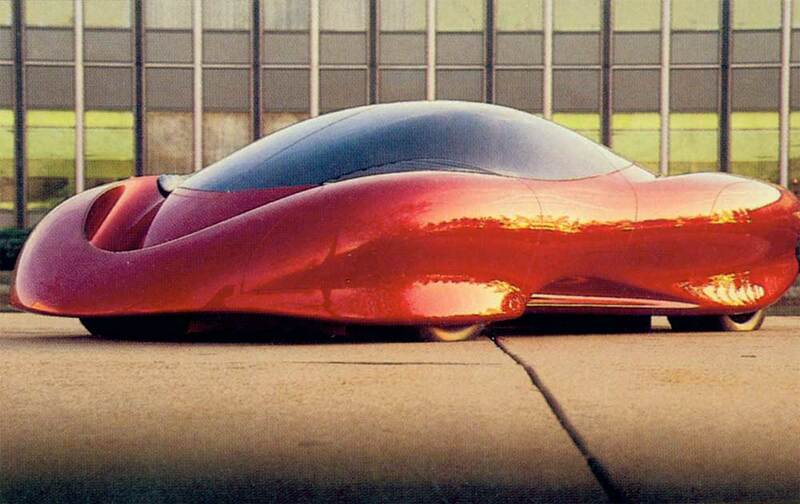 Video of the 1987 Olds Aerotech concept car driven by racing legend A.J. Foyt at the Fort Stockton Test Center in Texas. Turn your sound off. The background music is awful. But the video is interesting. Ed Welburn is in the tape. 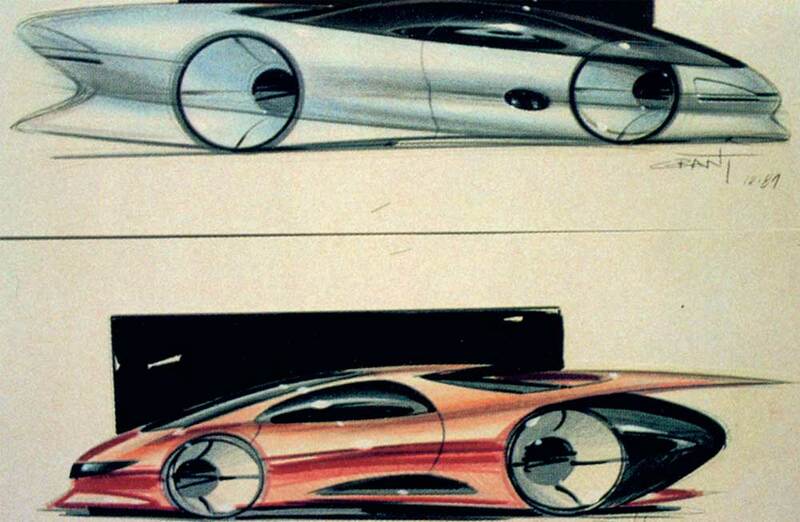 Gray Counts designed the Epcot Car, so named because it was created for GM’s Epcot display at Disney World in Florida. 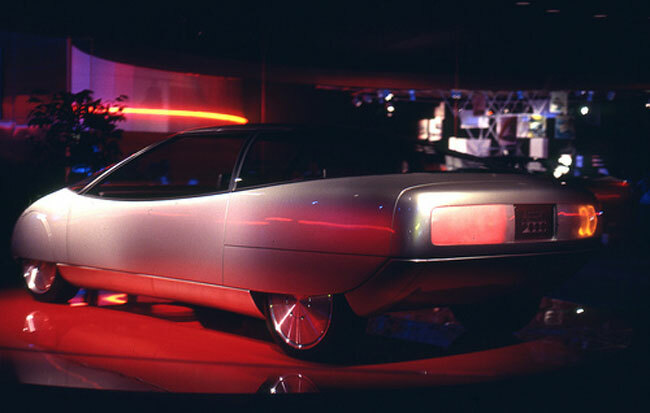 In the gallery there is a magazine ad that featured the car and the words, “We’re the best GM ever.” The Epcot car, called the Aero 2002 in the ad, was an experiment in low drag aerodynamics. Quite a departure from the Bill Mitchell days. The Voyage was originally envisioned as a future Seville, and designed to take the division a step beyond where it is now. 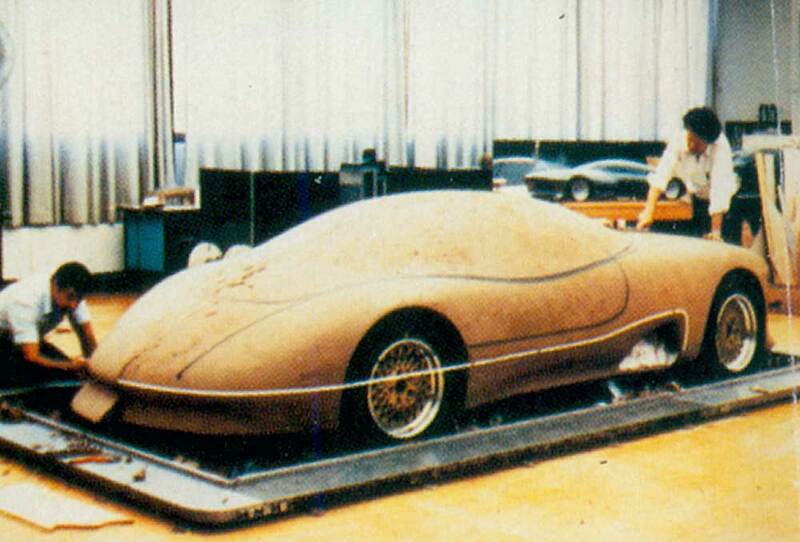 Originally designed to have a V-12, the car appeared at the New York show with a V-8. “It’s a question with Cadillac: Is it time to leave all the past behind and join the world? Cadillac has a wonderful heritage but the Voyage was designed to put it into a worldwide arena. We weren’t just doing it for someone in Kansas. This isn’t the mainstay. This is the lead car,” said Jordan. 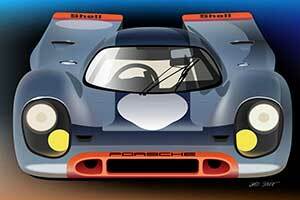 So how do you differentiate the lead car and put the car in a worldwide arena? Glass. 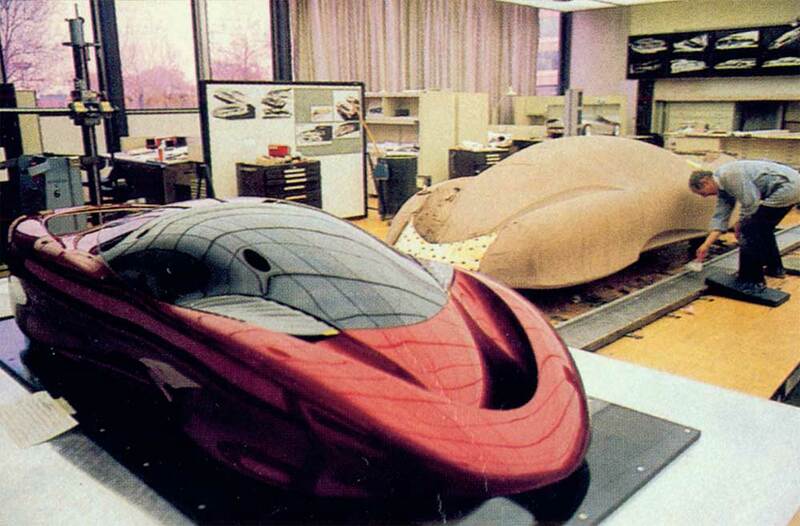 Allen Young, Chief Designer of Advanced Studio 4, states,”One of the main design features of the voyage is the use of glass which covers the top of the car. We did things the glass companies didn’t think they could do in the past. We treated the glass more like sheet metal. 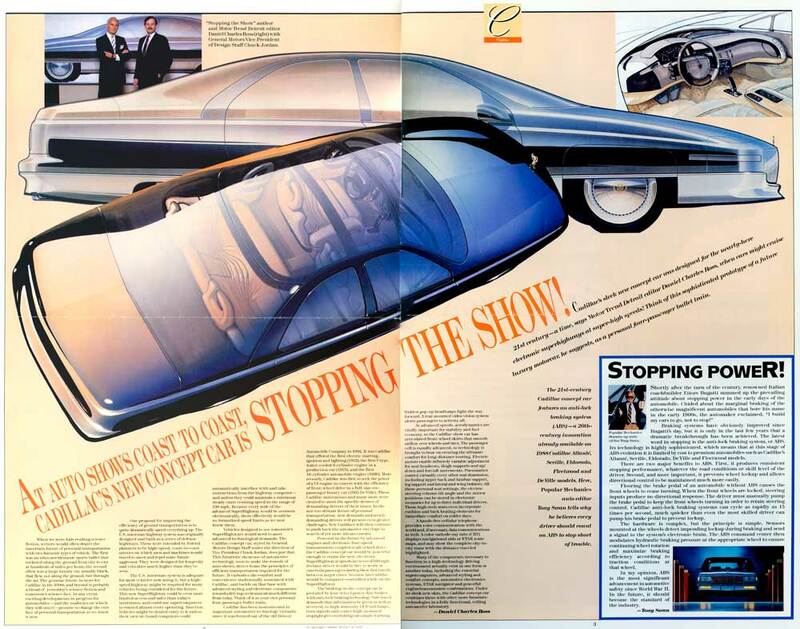 The use of glass says that Cadillac is a more expensive car and that there are things we can do with glass that Oldsmobile and Buick can’t do.” Apparently Mercedes and BMW thought differently. 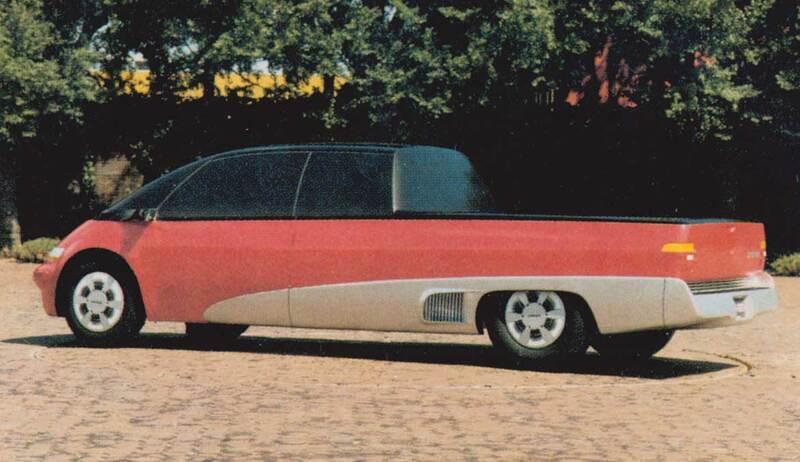 The Centaur is a mid-engine truck concept with room for five plus a traditional bed in the back. 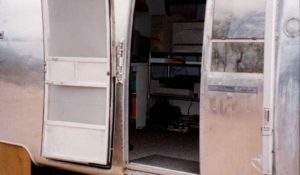 According to Jim Brinkerhoff, the interior designer for the Centaur, the interior design has large buttons and switches making them easily accessible so the driver doesn’t have to take his eyes off the road. This is before cell phones and text messaging. I read once that some state was banning the use of cell phone use in cars. Drivers asked what they were supposed to do with their extra hand. 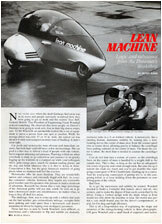 The Lean Machine is not in the Automotive News feature article, but is a very significant vehicle nonetheless and needs to be mentioned. 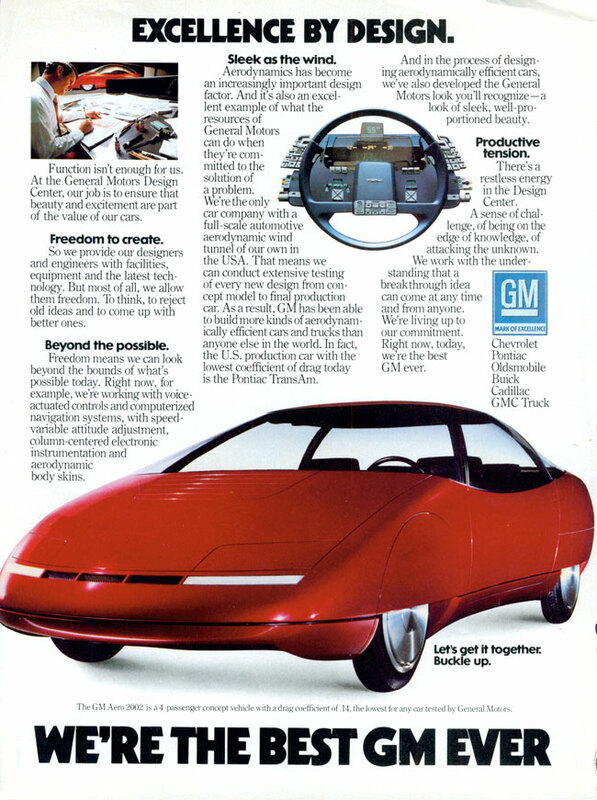 It was a great idea that perhaps wasn’t a product for General Motors directly, but GM possibly should have done something with it. 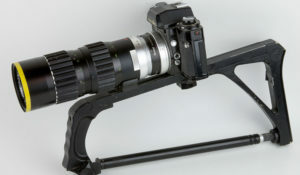 The concept has been successfully copied by several companies. Included in the post are two PDFs that can be downloaded either here or at the bottom of the post. One is an Epcot brochure, and the other an article from Road & Track magazine. The Venture was smaller than the Caprice but larger than the Celebrity and fit in with the division’s mission of being entry level but providing more than the customer expects. “The other part of our mission statement is to make sure we don’t do any boring cars, that whatever we do is exciting and youthful,” said Don Lasky, chief designer of Chevy 1 Studio. 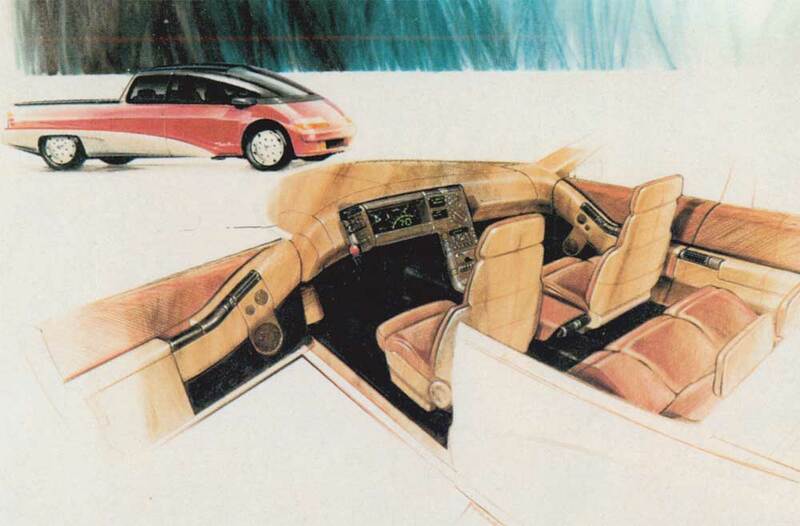 “The Venture embodies that new spirit of exciting, youthful design.” Complete with removable glass roof. You know, there needed to be more communication between engineering and design. Air conditioning engineers were planning to make A/C compressors smaller. Those big 40-pound A/C compressors installed in ’66 Buicks were going away along with the R-12 refrigerant that made them work so well. All of that glass looks great, but what we really needed was less glass and thicker roofs with more insulation to compensate for the deteriorating A/C performance. 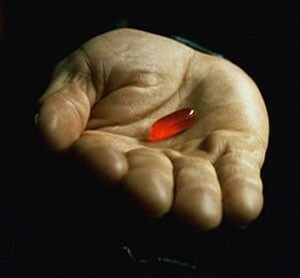 I live near Phoenix, Arizona so that may influence my thinking. 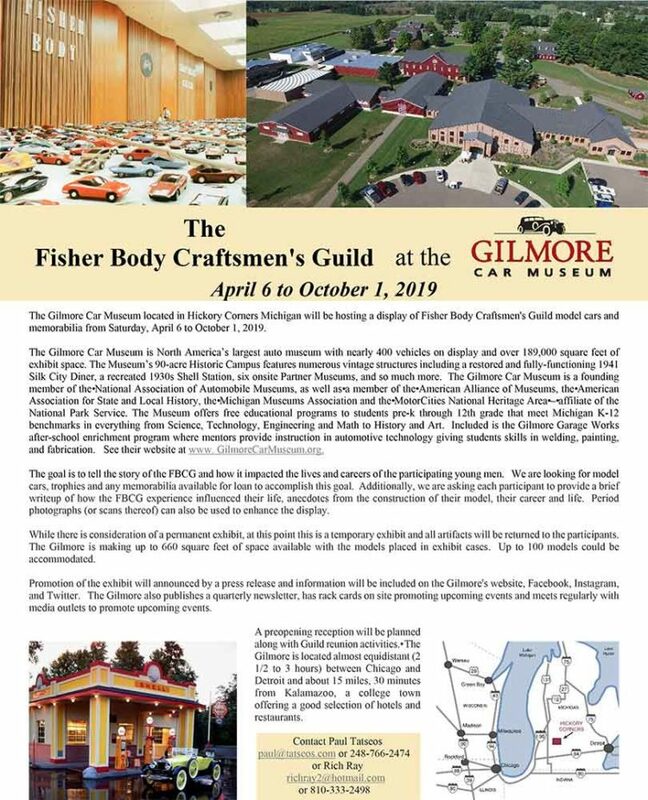 Click on a cover to download the PDF file. 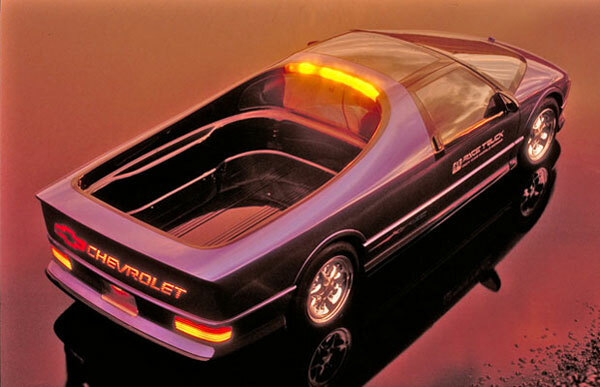 One of my favourite Image Designs from GM in this period (which is not shown here) was the Chevrolet XT-2, a futuristic El Camino. It was alot more of an exciting design for a truck than the Centaur. Its a real shame that pick-up truck design didn’t go this way instead of the horrible Brinks Armored look that is around today.